When you play sports it is necessary to have the right equipment to be effective and enjoy yourself while you play the game. 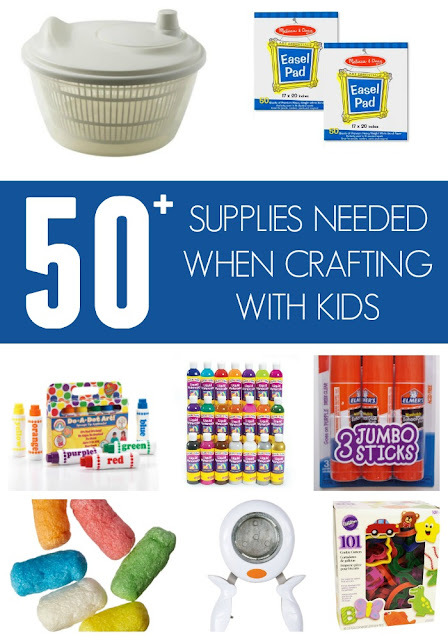 Similarly, when you are creating, learning, and crafting with kids, you need the right equipment or materials in order to have the best time. There is nothing worst than starting a painting project and having the paintbrushes FALL APART (that has totally happened to me before) or the permanent marker be all dried up and unable to write. Most of the supplies I use are pretty basic, but over the past several years I have definitely found some things I like better than others. Today I'm going to share MY top 50+ supplies that you need when crafting or playing with kids. Once you read my list, please add anything you think I missed in the comments so that we can make this an even better resource. If you like a different type of scissor or glue, share that too. I want this post to be helpful and make it easier for you to enjoy crafting with your toddler (or bigger kids). In the list below I have shared a few details about some of the supplies that we like. If a word is highlighted it means that it leads to an Amazon or other store link where you can purchase the materials. Affiliate links are included for your convenience. Sponge paint brushes, jumbo paint brushes, and even little watercolor brushes you get with paint sets can be nice to have on hand. We also like to make our own paint brushes using clothespins holding other materials like feathers, pom poms, and pine needles. 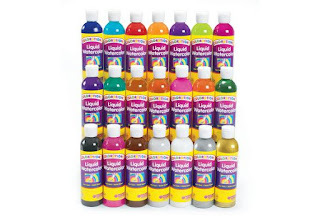 My favorite liquid watercolors come from Discount School Supply. When I want them sooner then I'll order Color Splash! 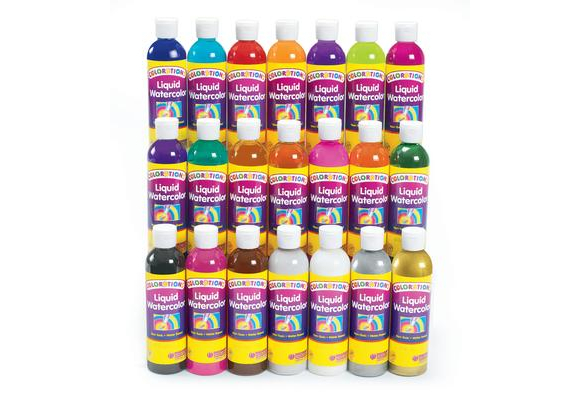 Liquid Watercolors on Amazon. I use these for spin art, drip painting, fizzy science, etc. Washable Tempera is my favorite paint to have on hand. I like the big bottles the best because we use a lot of paint and they last a little longer. Sometimes I will buy huge bottles at Discount School Supply. I usually just buy whatever coffee filters are the cheapest from the grocery store. You could probably find them at the dollar store as well. These are so fun to use for spin art, suncatchers, and other projects like fizzy science. 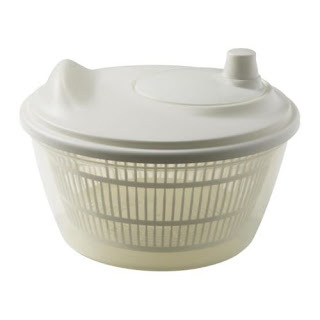 I love this Tokig salad spinner from IKEA because it is so cheap. I also love our OXO salad spinner because it is really durable. Both are probably the most popular art tools in our house. My kids love to make these go around and around. We have never actually used ours for salad, just art! I am a marker snob and really only buy washable Crayola markers. We've tried other brands before but really cheap ones end up not being washable and they ruin my table or kid's clothes. Crayola is always great as washing off skin and tables. We love the classic Crayola markers (broad point) and the Pip-Squeak ones too. I am a marker hoarder so if the kids get a dark spot on the yellow you'll often find me buying a new pack. Lately my kids love the Crayola Twistables (though toddlers sometimes just break them constantly). I also really like brand new packs of crayons and the 24 count Crayola box is my favorite one. Some of my kids have enjoyed the large washable crayons as well. Do you have a favorite? Chalk is a must for drawing outside on the driveway or back patio or sometimes we use it on paper indoors. Making chalk flowers and watering our alphabet garden is a cool way to use chalk for learning too. I usually just buy the cheapest bucket I can find that way I am not too sad when someone crushes the chalk pieces with a bike or steps on them accidentally. 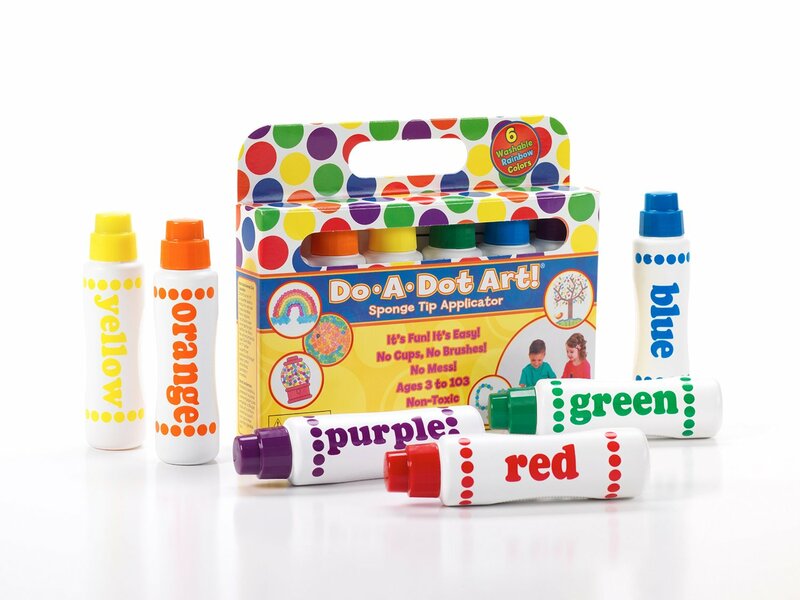 Dot markers are one supply we probably use every day. A roll of paper and dot markers can be so fun. We also use dot markers for paper plate crafts like our paper plate caterpillars and our rainbow snakes. We like the "Do-a-dot" brand but you can also make your own or buy another brand as well. The rainbow pack is a "must have" and then we also like the Brilliant marker set that has a few other colors. Our favorite stickers are ones we find in the dollar aisle at Target and the Melissa & Doug Sticker books. I especially love the ABCs and Number sticker books along with the animal and vehicle ones. We use stickers for collage crafts, matching activities, alphabet games, and other simple activities and crafts. Foam sheets can be cut into all sorts of shapes and used for different projects. I especially like the Peel & Stick foam sheets so you can turn anything you cut into a sticker. I like to cut foam sheets into different shapes for shape sorting and use them for art activities too. We love to paint with bubble wrap and wrap it around things to make noise or add texture to art. It is fun to have a variety of sizes to explore. I usually grab it at a local UPS office or save the bubble wrap that comes with packages. Check out our popping a rainbow game for one way we used it to learn colors. I have a large wooden rolling pin that is sealed and can be used for art and cooking and even playdough. Small kid sized rolling pins are also fun to use. I like to buy cheap white paper plates in big packages at the grocery store. You can use them as palettes when painting or for art projects, like butterflies or flowers. You can find 30 of our favorite paper plate activities here. 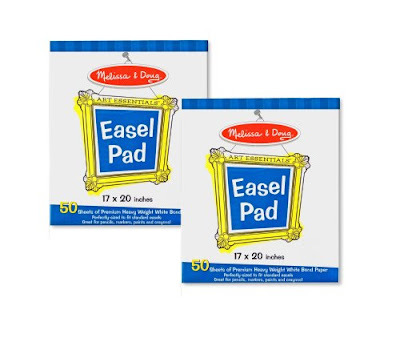 I like to buy large easel paper from Melissa & Doug. You can buy a two packs in a bundle and they last awhile. Sometimes I buy brown paper from the packing areas at Target. I also like to buy big rolls of white paper from Melissa & Doug. We use big rolls of paper to make giant drawings, matching games, painting, or even coloring walls. I have to keep a roll of painters tape in every room of our house. We are always finding ways to use it. We especially love using tape for art. It is also useful to hang art or even make train tracks or car roads. My favorite kid scissors are a pair of cozy padded scissors from Caliber. The soft handle makes cutting, "cozy" according to my 5-year-old. We also like Westcott scissors with the blunt end along with the normal pointed ones. Scissors are essential for a variety of craft activities. 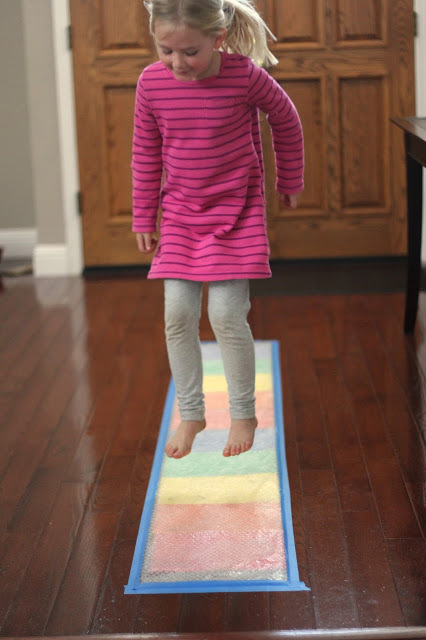 They are a great tool to help kids strengthen fine motor skills as well! My kids love the jumbo purple Elmers glue sticks because you can see where you put the glue... and eventually the purple disappears. We love Elmers washable no run white school glue. Any white glue will work when doing most craft projects although you need to give ample time for the glue to dry if the kids use a lot of it. Tacky glue works best on fabric and felt. My favorite tacky glue is Aleene's Tacky Glue. I like to buy the three packs of small tack glue so that the kids each have their own. Tacky glue is great if you are using felt and trying to glue anything to it. Our sparkly felt fish used tacky glue and so did our bumble bee craft. Make sure you buy a low heat glue gun so that you and your kids don't burn their fingers. If you have a favorite glue gun, tell me! I haven't found one that I love yet so I am always trying new ones out. I prefer cardstock over construction paper because it is thicker and more durable. I am a bit of a cardstock hoarder and buy a pack probably every time we go to the store. We use this a lot, especially for printing out various printables. I buy computer paper in bulk at office supply stores. 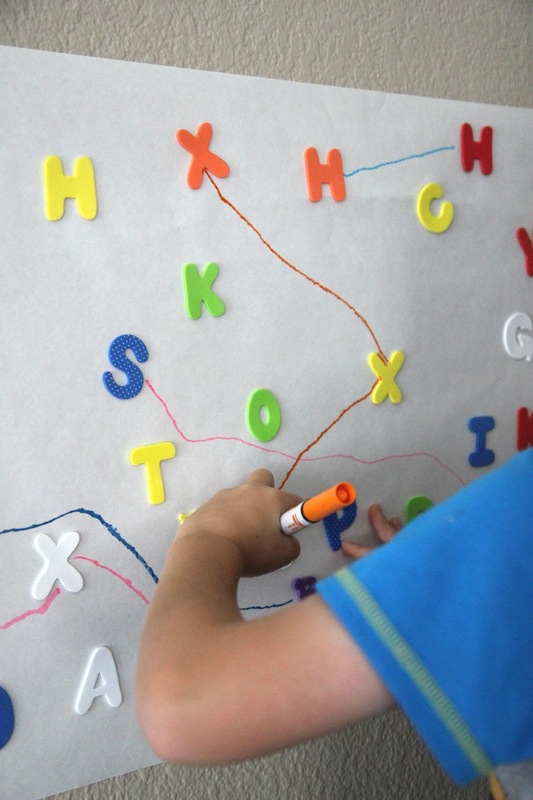 Contact paper is especially great for sticky wall activities, like our alphabet sticky wall and ocean sticky wall. Clear contact paper taped up sticky side out using painters tape plus some fun materials is the perfect activity to keep little ones busy and exploring! I save tissue paper from gift bags and boxes. I rarely buy tissue paper and just use the leftovers that people are ready to get rid of after birthday parties and other gift giving events. I love to make crayon shaving suncatchers with wax paper and an iron. Wax paper has a different texture so it is fun for kids to cut when they are working on scissor skills. Two of my favorite circle craft punches are the XL Fiskars lever craft punch (2 inch circles) and the Round N' Round Fiskars XL squeeze punch (2 inch circles). I also have some larger ones that make 3-3.5 inch circles. We use circle punches for shape activities and matching activities all the time. We also use them for collages or other crafts. Craft punches are great for strengthening finger muscles. I love buying giant containers of buttons online. Amazon has all sorts of buckets you can buy depending on the colors, sizes, etc. I also buy buttons at JoAnn's Fabrics. You can purchase Magic Nuudles at Lakeshore Learning and online on Amazon. They are so fun for building and creating, so now that are on my "must buy" list. All you have to do is moisten them in order to begin building with them. You don't need tape or glue. We love building alphabet letters. Large Ziploc bags are especially awesome for mess free painting. We love to use cookie cutters for alphabet science and for painting projects. 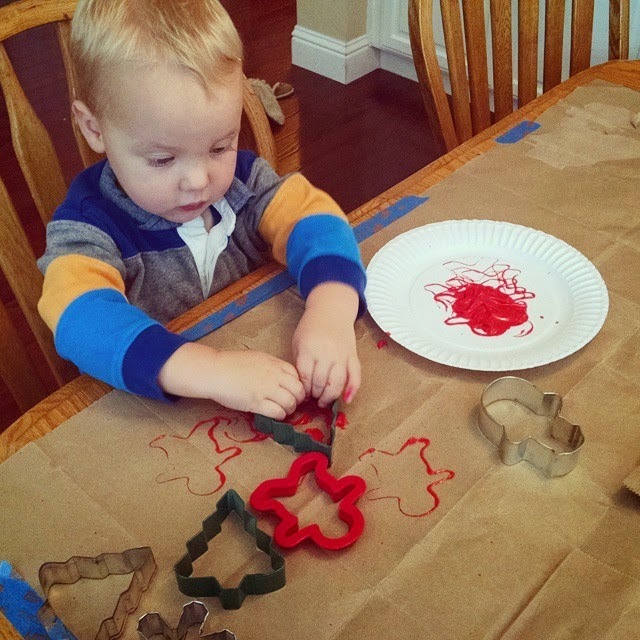 Cookie cutters are also great for sensory activities. Although you can buy cookie cutters at the Dollar Store, my favorite ones are the more durable plastic ones from Wilton. If you cut up pool noodles they are fun to use for painting and building. Cupcake liners can be glued together and used in a variety of ways to create many things. We especially love to make cupcake liner flowers and cupcake liner bugs! Traditional clothespins can be used to make fairy dolls or spring clothespins can be used to create clipping activities like our shape clothespin matching game. Alright, so what other craft or play supplies did I miss? What would you add to this list? Now that we have all of these items collected, how do you store your craft supplies? Have any tips for me? 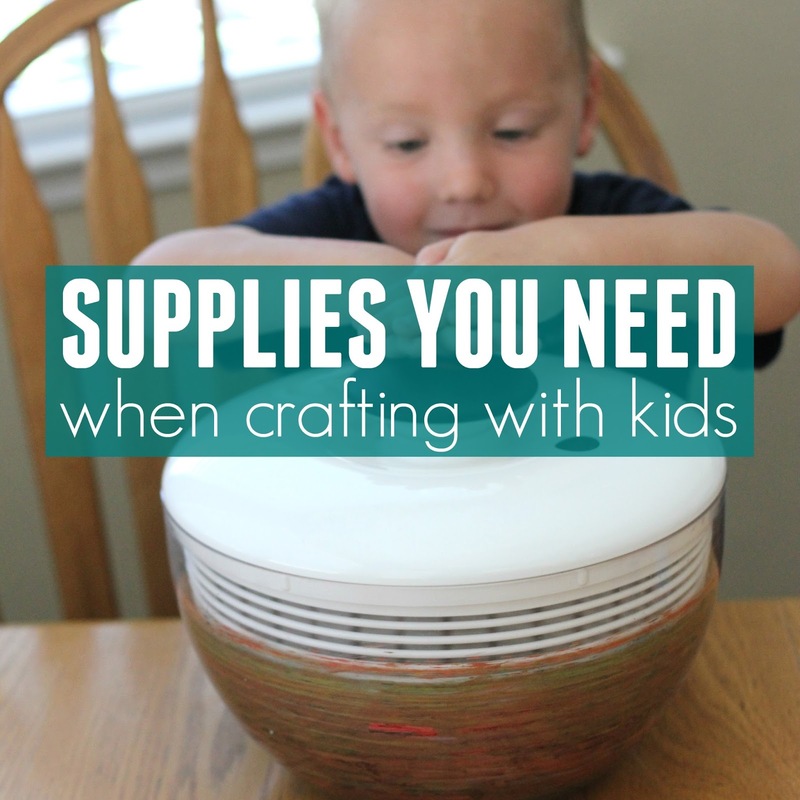 Check out our 10 FAVORITE supplies here with crafts to match. We use tons of white copy paper too! But you can get it free from staples! If you watch sales and can pay out of pocket first, you can get a refund check or visa card (to use anywhere). And then its free! You can usually buy 4 at a time. I need to see if card stock ever goes on sale like that! such great info! will have to check it out. Thanks Sarah! I've seen lowercase and number foam stickers at some dollar stores - usually the independently owned ones. They are by angela's crafts, I believe. They are on my shopping list for sure.